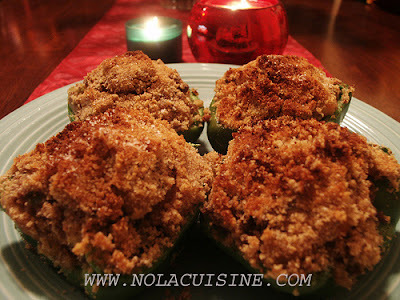 I based this on Austin Leslie‘s recipe from the book Creole Feast by Nathaniel Burton, they were absolutely delicious. I recommend par cooking the bell peppers to shorten the baking time. 2 Large or 3 Small Green Bell Peppers, halved lengthwise, seeds removed and stems carefully trimmed away. Melt the margarine in a large skillet. Add the onions, celery, parsley, and thyme. Season with a little salt & pepper, and cook for about 10 minutes or until the vegetables are very tender. Add the beef and cook for about 5 minutes, breaking up the meat, lightly season again. Add the shrimp and cook until just cooked through. Remove from the heat. When cool enough to handle work the bread into the mixture with your hands as you would for meatballs, or meatloaf. Taste for seasoning, adjust if necessary. Incorporate the eggs and garlic. Place the stuffing in a lightly greased oven safe dish, bake for 1½ hours. Remove the stuffing and chill. If any fat settles on the top remove it. Mix the bread crumbs with 3 Tbsp melted margarine, season with a little salt & pepper. Par cook the halved bell peppers in boiling water until slightly tender. Stuff with a generous amount of the filling and top with the breadcrumb mixture. Broil on low for 15-20 minutes, or until the stuffing is heated through and the bread crumbs are slightly browned. Why margarine? Is it a flavor thing or does the margarine work better than butter in this recipe? The recipe looks mighty good, though.